Her parents played a key role in India's Liberation Movement from under British rule. Her father, a close associate of Mahatma Gandhi, was a member of the Constituent Assembly of India and helped write free India's first constitution. He was a renowned scholar, master of 14 languages, and translated the Koran in Marathi. Her mother was the first woman in India to receive an Honors Degree in Mathematics. Amazingly, without any financial support from any person, Shri Mataji neither charges for Her lectures nor for Her ability to give Self Realisation, nor does one have to become a member of this organisation. She insists that you cannot pay for your enlightenment and to-date she continues to denounce the false, self-proclaimed "gurus" who are more interested in the seekers' purse than their spiritual ascent (see our Seeker's Guide). 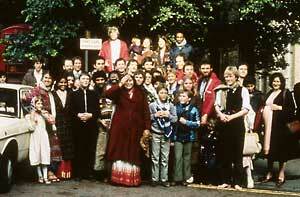 Since 1970, Shri Mataji Nirmala Devi has kept a busy schedule, travelling around the world to teach the techniques of Sahaja Yoga meditation. She has demonstrated her capacity to trigger the awakening of the spiritual power in human beings (Kundalini) at an "en masse" level. Shri Mataji has delivered thousands of lectures, given many television and radio interviews, and been the subject of hundreds of newspaper articles around the world. An articulate speaker, Shri Mataji is the founder and sole director of Sahaja Yoga or "Vishwa Nirmala Dharma", which is an established non-profit organization in many countries worldwide. Shri Mataji has been recognized worldwide by several prestigious institutions for her selfless work and for the powerful results of her spiritual teachings. In 1994, the Mayor of Brazil's capital welcomed Shri Mataji at the airport, presenting her with the key to the city, and sponsored all of her programs. 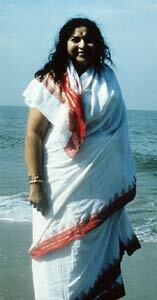 In 1995, the Indian Government granted Shri Mataji a one hour primetime television series, broadcast nationally. During the same year, Shri Mataji was an official guest of the Chinese government and was invitied to speak at the International Women's Conference in Beijing. Also in 1995, she was awarded by the Romanian Ecological University an Honorary Doctorate in Cognitive and Parapsychological Sciences. She has been recognized and greeted by the mayors of several cities in North America (Yonkers, NY, 1994 & 1996, Los Angeles, 1993 and 1994, British Columbia, 1994, Cincinnati 1992, Philadelphia 1993, Berkeley, 1997). She was given a Proclamation by the US Congress in 1997 which was submitted to the Congressional Records. 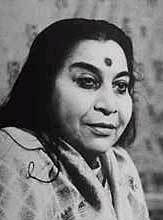 Shri Mataji was declared "Personality of the Year" in 1986 by the Italian Government.